Chelsea's fourth Premier League title - which has looked an inevitability for some time - is secure with three games to spare. A 1-0 win over Crystal Palace on Sunday gave Jose Mourinho his third English championship medal. Manchester City stay second after a 1-0 win at Tottenham, while the surprise result of the weekend was West Brom's victory by the same score at fourth-placed Manchester United. At the bottom, there were vital wins for Leicester,Aston Villa and Sunderland, but QPR and Burnley are on the brink of relegation after they both lost. Here's who stood out in the Premier League for me this weekend. If you are going to have the game of your life, you might as well have it at Old Trafford and on your 50th appearance for your club. Wales international Boaz Myhill is standing in for first-choice goalkeeper Ben Foster at West Brom, but you wouldn't have guessed he was the deputy. Two attempts by Robin van Persie were dealt with brilliantly by the Baggies keeper but his penalty save was the turning point - one that provided West Brom with the victory. An outstanding display of goalkeeping. How refreshing it was to see a good old-fashioned contest between a winger and a full-back at Stamford Bridge on Sunday. Chelsea's Branislav Ivanovic and Crystal Palace's Yannick Bolasie went at it like two prize fighters slugging it out and without any interference from the referee. Sadly for Bolasie and Palace, Ivanovic won on points. You cannot play in every game for a championship-winning side and not have a profound effect on your team's season. John Terry holds the distinction of having played every minute of every match for Chelsea this season and at no point has he looked like a man who is coming to the end of his career. That said, the former England captain owes a great deal to Jose Mourinho, who has built his team around the defender. It used to be William Gallas and Ricardo Carvalho who partnered John Terry to great effect. 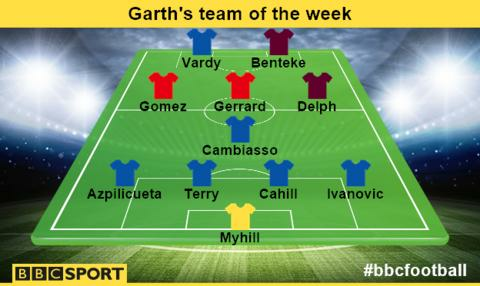 Now it is Gary Cahill who has taken over that mantle - and done it brilliantly. It was business as usual for Chelsea against Crystal Palace as they got the job done. Some critics will claim that this title-winning team was dull in comparison to others. But defenders are paid to defend - and Cahill and his team-mates have done it better than any other Premier League team this season. The Spain international is the final member of what has become a very difficult Chelsea defensive quartet to break down. Cesar Azpilicueta is a very different player to Ashley Cole but he has filled the void at left-back admirably. The solid unit created by him and his fellow defenders has become a feature of Chelsea's performance this season. It was another gritty display against Crystal Palace. Leicester City looked to be down six weeks ago, but that was before they put together a series of victories I thought would be beyond them. Central to this extraordinary run of results - including Saturday's 3-0 win over Newcastle - has been the Argentine midfielder Esteban Cambiasso, who continues to show why he was so influential during his time under Jose Mourinho at Inter Milan. Against a woeful Newcastle, he showed the drive, passion and commitment that was so lacking in the opposition's performance. I raised eyebrows when Nigel Pearson brought the aging Cambiasso to the King Power Stadium. But it has probably been the manager's most significant signing - and it might save his season. Here is a player who has found his way again under the direction of manager Tim Sherwood at Aston Villa. After his impressive display against Liverpool in the FA Cup semi-final, Fabian Delph got rave reviews for his performance in Saturday's 3-2 win over Everton. I suspect football fans from Merseyside are beginning to get sick of the sight of him by now. A missed penalty is no way for a football legend to leave a club - particularly one where he has had such a significant impact. So I was particularly pleased to see Steven Gerrard's header fly into the net, even though Liverpool's 2-1 victory has probably condemned QPR to a season in the Championship. As the former England captain prepares to exchange Liverpool for LA Galaxy, he looks a player who still has so much to offer. May I doff my hat to a football icon who, over the years, has probably appeared in my team of the week more times than any other player. It has been a real pleasure. If you play for a team at the wrong end of the table, you are going to need two things: composure and nerve. Jordi Gomez demonstrated both in abundance during Saturday's 2-1 win over Southampton, with his two successful penalties taken in difficult circumstances. If Sunderland can continue to pick up points under this pressure, I see no reason why they should not survive. This lad caused Newcastle so much turmoil on Saturday that centre-back Mike Williamson could not resist but take a lunge at the lively forward in an attempt to slow him down. It did not do Newcastle any good, as Williamson received his marching orders and a sharp rebuke from his beleaguered manager John Carver. Then, just when you thought it could not get any worse for Newcastle, full-back Daryl Janmaat fouled the same player and also got sent off. I suppose Jamie Vardy could take this special attention from Williamson and Janmaat as a compliment? So, Christian Benteke continues to score goals amid the Tim Sherwood revival at Aston Villa. The difficulty with the striker's outstanding performance against Everton is this: If he continues in this rich vein of league form and Villa then beat Arsenal in the FA Cup final, will the Belgium international stay? There are tougher problems for Sherwood to consider but it is one I think the Villa manager may have to face very soon. Oh, the price of fame.